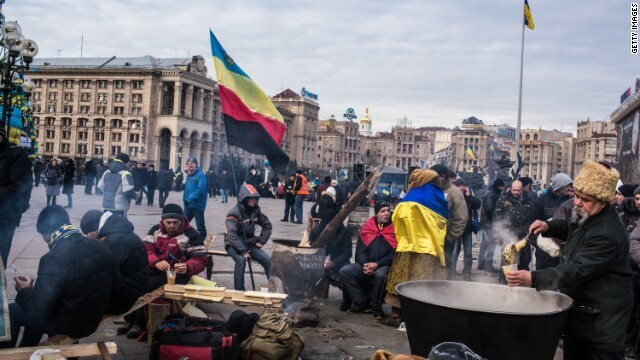 A man serves soup to anti-government protesters in Independence Square on December 4, 2013 in Kiev, Ukraine. Is Washington joining 'bidding war' with Moscow over Eastern Europe? The protests in Ukraine against President Viktor Yanukovich's last-minute decision not to sign a political and trade agreement with the European Union are the biggest in the country since the 2004 Orange Revolution that booted Yanukovich, then Prime Minister, from office. And U.S. Secretary of State John Kerry was tough Tuesday in his criticism of the government's use of force against the peaceful demonstrators, saying "violence has no place in a modern European state." But his decision to skip a visit to Kiev and attend a meeting of the Organization for Security and Cooperation in Europe wasn't necessarily a response to the political upheaval and a voice of support for the protesters, nor was it an indictment of the government's heavy-handed methods to combat it. The snub was, in effect, a U.S. protest of the government's moves to align its trade interests with Moscow by deciding not to join the EU agreement. The so-called Eastern Partnership is designed to forge closer EU ties to Ukraine, Belarus, Moldova, Azerbaijan and Georgia. Kerry said Ukraine should be free to choose its own path dictated by the will of the people. Yanukovich, he said, has made a "personal decision" that the Ukrainian people do not support. "Europe and Europe's friends all declined to engage in a rather overt and, we think, inappropriate bidding war with respect to the choice that might or might not be made," he said. But he added that the U.S. wanted to help "get the Ukraine back on the road to European integration and to economic health." While not mentioning Russia by name, Kerry's veiled references were at jab at Moscow's own strong-arm tactics to persuade the former Soviet republics to abandon the EU in favor of its own economic network of former territories, with Moscow as the driving force. The West sees the decision by Ukraine, the largest of the former republics, not to partner with the EU as a bow to Russian pressure. When asked Wednesday about the situation in Ukraine, Russian Foreign Minister Sergei Lavrov called the situation a "domestic issue" and said it's the prerogative of the government to decide whether to sign the agreement. A senior State Department official traveling with Kerry said Washington had made clear to Russian leaders that "we think that kind of play is self-defeating" and urged Moscow to further integrate with Europe by increasing free trade by removing barriers and tariffs. "If Russia's neighbors become richer and more prosperous as a result of having visa liberalization to the European Union and increased trade, they are more able to buy more things from Russia as well, and they are more stable on Russia's periphery," the official told reporters. "Our message has been to take off the zero-sum glasses; all boats can rise here." Instead of visiting Ukraine, Kerry will travel to the EU-friendly nation of Moldova, the poorest country in the region, which did sign the agreement in the face of Russian retaliation. Moscow recently banned imports of Moldovan wine, one of the tiny nation's largest and most profitable sectors, and has threatened to cut back on its deliveries of natural gas. Pointedly, Kerry will attend a trade and investment event at the Cricova Winery in Moldova's "wine city," whose wine cellars are a popular tourist attraction. "We wanted to send a very strong signal of support for those countries that had moved forward with the EU because of what it means in terms of their commitment to reform," a senior State Department official traveling with Kerry told reporters. "Had that been the case with Ukraine, it would have been a tougher decision whether to go to the OSCE, but since that didn't happen, we're going where the European decisions were made." By supporting nations that choose Europe over Russia, is the U.S. joining the bidding war that Kerry rejects? Given that the America has only given about $1.1 billion in assistance since 1991 when the former republic gained independence, Washington, along with its European allies, will have to up its bid to continue to win the economic battle with Moscow. Another failure for Kerry and Obama! I hope that the protesters in Ukraine know how many millions of supporters they have in the West! It has become self evident that the right-wing thugs in Washington are now endeavoring to take over as much of Eastern Europe as possible. I wouldn't be at all surprised if those demonstrations in Kiev were led by agents from the C.I.A. I guess that Central and Western Europe are no longer enough for these greedy people in Washington. If Ukraine did join the EU, it would be a big mistake. Did anyone here notice what's going on in Greece and Italy lately? I guess not. I did, George. How right you are! When our gov shuts it self down to spite us, destroying our credit rating and damaging the country, it leaves open a bit of an opportunity to do this kind of thing. This sounds like an effort to keep the gates open gushing cash everywhere but in our own country. We can't really do much about it till we act like one country and stop scuttling ourselves because of politics. Putin isn't dumb. He has a huge sense of national pride, and probably feels it is his responsibility to rebuild russia. I hate to say it but a strong russia is better for us than a strong middle east . The path of undermining governments in hopes a new more friendly one forms are tested and failed. At some point we should consider not trying to stop it and looking for something mutually beneficial instead. Just like our politics , the world is broken trying to support a 'two party' system. So basically the entire world wastes 50% of its resources. Find common ground and work together.